Greg is always very nice and informative. We loved it! We will be back again. Greg is very knowledgeable and professional. Working with Greg has always been professional and simple. Very nice and loaded with necessities. We really enjoyed the property. Very peaceful and quiet with lovely views. Greg was quick to respond to our needs and questions. He also was kind enough to let us check in early. That made a great difference in being able to Grocery shop before the rest of my family came. Very knowledgeable, helpful and easy to work with. Wonderful! Would do it again in a heartbeat! Greg was courteous and thorough. He made sure we got in all the necessary paperwork beforehand and that we knew the code to get in upon our arrival. He left us a thoughtful complimentary bag of goodies and a helpful binder of information on the rules and restaurants and things to do in the area. Greg responded promptly to my email on a Saturday and was able to extend our checkout time by a few hours at no charge. Overall I greatly enjoyed my stay! 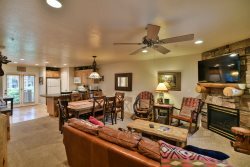 The unit was very comfortable and extremely clean with lots of amenities both in unit and on the compound. Greg from Basinview made our stay an easy and straightforward experience and elevated it with complimentary snacks and toiletries. I've said pretty much all I've needed, top-notch experience! And the fact that I didn't have to,nor required to, book through the hell hole known as VRBO is very important! Greg was most helpful & professional. Thanks. This property was the perfect place for our ski group (4) to stay. We loved everything about the property and location. We well be back and bring the rest of our family next time. Top rate property and services, outstanding value.